I was tagged by Punk’s House of Books (many thanks!). I stole the image from previous posts. I wrote this over the Christmas holidays btw. 1. Iceland – I want to live there, and it’s been snowing there on and off all month! WANT! 2. Scotland. How have I never been? 3. A castle, any castle. Always. 4. I’m at my parents house right now which is lovely, but I also miss my flat and my own bed! 2. Mushrooms. Slimy slugs. Ugh! 3. Green trees or white trees (cauliflower and broccoli). I love vegetables but I just don’t like the taste of these at all. 4. Tinned ravioli. Ygh. We used to have this as kids and I always called them pockets of poo. You’re welcome! 2. Pork steak with Stilton sauce. Mmmm pig and cheeeeese. 2. Hopefully getting a new, amazing job. Or failing that, just a job. 3. Maybe going on holiday in summer if #2 happens. 4. The unknown! Here’s to new adventures in 2015! 3. LOL – I started off saying LOL to take the piss out of people who say LOL. Now I say LOL, LOL! Only if you want to, no pressure!!! 1. Chrissi @ Chrissi Reads. 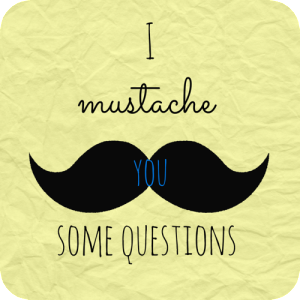 Author lipsyyPosted on January 16, 2015 January 15, 2015 Categories Surveys/Questionnaires/Tags/Blog Hops, UncategorizedTags About Me, Blogging, Books, Life, Questionnaire, Tag12 Comments on Mustache Questions: About moi!